This is my first Jupiter-free update in a while. This pic is of a planetary nebula, a dying star, in the summer constellation Vulpecula. 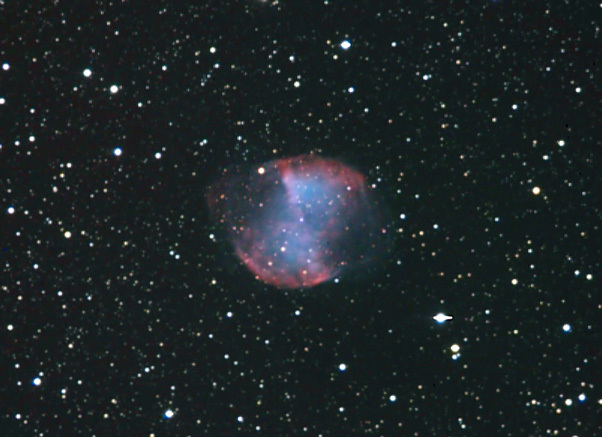 It's called the Dumbbell Nebula but I think it looks more like a Bowtie Nebula. It's object #27 on Messier's list. I took this picture with my 100mm refractor, the color data is from an image I took a few years ago with my DSLR, and the brightness (luminosity) was captured last month with my ST-402, a highly sensitive monochrome camera. I combined the two images in Photoshop. You can click on the pic to get a slightly larger version.